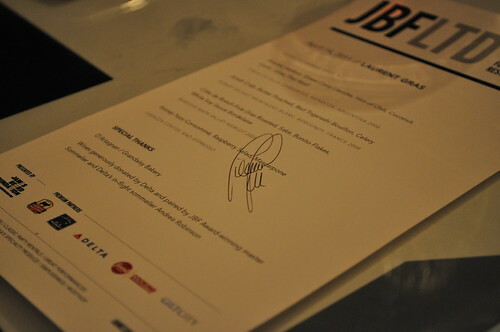 I first heard about JBF LTD, i.e., the pop-up restaurant organized by the James Beard Foundation (thus, the LTD, representing a "limited" time of twenty-seven days) via The Food Section and then discovered that Michelin-star winning chef, Laurent Gras, formerly of L2O in Chicago, would be the first "in resident" chef of the Foundation's pop-up restaurant via Grub Street New York. Since Chef Gras announced he would be leaving L2O back in November, not long after he was granted the intensely sought-after stars (three, to be exact--the only other restaurant to receive the honor in Chicago next to Chef Grant Achatz of Alinea) by Michelin, I was excited to hear that there would be an opportunity to try his food in Manhattan under a new menu for a limited time! I immediately signed myself up for Beard Bites, the newsletter organized by the James Beard Foundation to inform me of when tickets would be on sale for the pop-up restaurant dinner featuring Chef Gras himself. I got really lucky. I am an avid follower of Gilt City, an exclusive metropolitan deal site (whose mission aims "to unlock the very best your city has to offer for less"), and I scour the Company's daily deal e-mail each and every morning for anything that may be of interest to me (especially in the culinary area). Low and behold, when I saw the deal offered on April 7, for Chef Gras, I immediately picked a date (for an 8 PM reservation) and booked them. I later find out that not only did Gilt City only sell twenty 8 PM spots (the remaining sold through the James Beard website) spread over multiple days for this dinner, but tickets sold out of this first week's tickets in less than 40 minutes! This meant I was one of the lucky holders of two of these spots! Insanity! 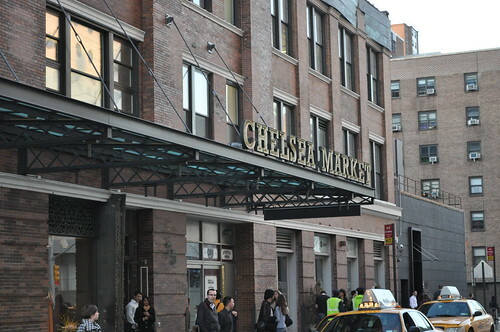 Marcus and I made it to Chelsea Market (where the pop-up is located) at around 7:15 (our reservations were for 8 PM) to ensure we had enough time to check in and check out the space before the dinner began. 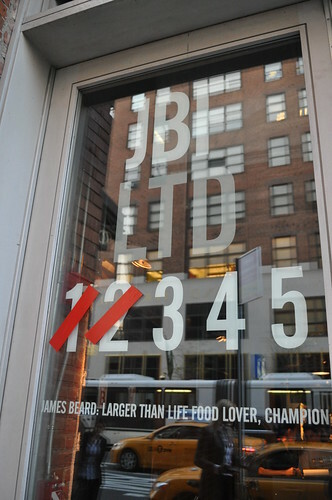 We went inside Chelsea Market and saw a door for JBF LTD, but not realizing the main entrance was on the street side. We went back outside and noticed the really awesome window text. 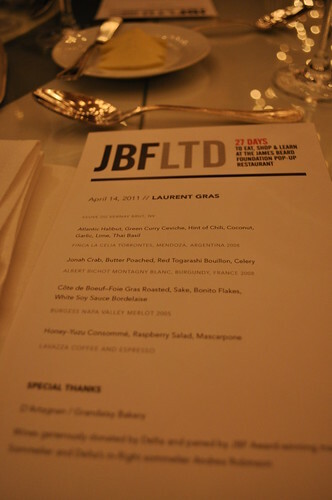 JBF LTD held its first dinner two days prior to ours, appropriately having 1 and 2 "crossed-out" or "marked off" as one would on a calendar for a countdown. As a brief introduction, JBF LTD defined a "pop-up" on its "About" section as a verb (i.e., "to appear suddenly, unexpectedly") and as an adjective (i.e., "unexpected, sudden, finite, three-dimensional--a pop-up toaster, a pop-up book, a pop-up window on a computer screen, a pop-up restaurant"). The concept of a pop-up has been a recent trend as of late in the restaurant business (e.g., What Happens When, LTO, etc. ), but the Foundation noted that it "has been producing a pop-up restaurant almost every night for the last twenty-five years." 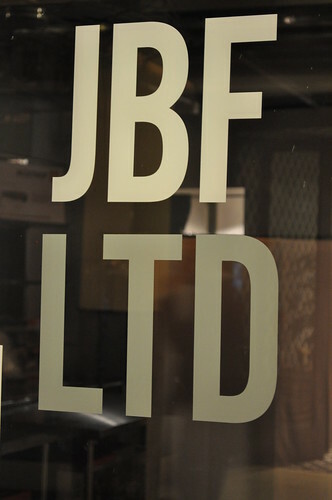 Perhaps the only difference for the Foundation is that JBF LTD is housed in a totally new space from its headquarters (i.e., The James Beard House) in the West Village. James Beard: larger than life food lover, champion of American Cuisine, mentor of chefs, prolific cookbook author, pioneer of seasonal eating, inspiring teacher . . .
James Beard Foundation: continuing James Beard's legacy by celebrating, nurturing and preserving America's diverse culinary heritage and future. I thought the layout of the text along the windows worked really well, and the use of red tape cross-outs was really clever, to mark each day the pop-up was open. As we had arrived early, the mâitre d' told us we could wait in the waiting area which had a few cocktail tables and stools. 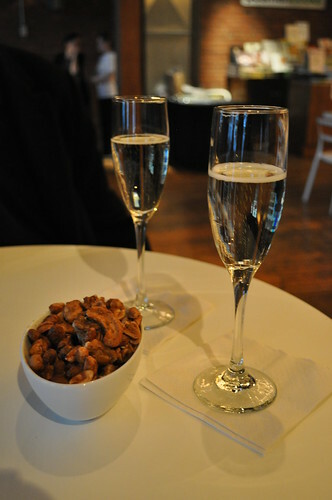 There were dishes of seasoned assorted nuts on the tables to munch on. The wines served that evening were generously donated by Delta and paired by JBF Award-winning master sommelier (also incidentally Delta's in-flight sommelier), Andrea Robinson. One of the servers came over to serve us sparkling wine--Veuve du Vernay from Brut, France with no vintage. I liked that it wasn't too dry or too sweet. It had a nice balance to it. I think Marcus and I had about two or three glasses of this before we were seated--you can probably imagine we were in a very happy place by the time dinner began. 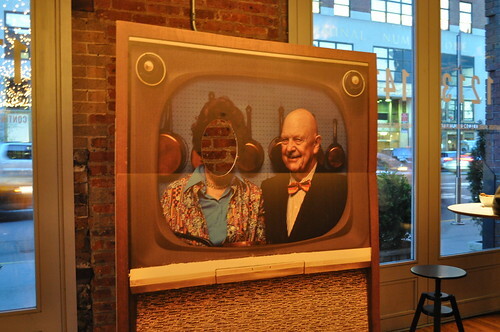 In the waiting area, there was one of those cardboard things where you can stick your head and get a photo of yourself as Julia Child with James Beard himself on a retro television set. Inside JBF LTD. The restaurant's designers, Biber Architects, were given a shoestring budget ($5 per square foot, to be exact) to design the restaurant to be filled in the space at Chelsea Market. James Biber, head of Biber, strongly believes in "architecture as an expression of identity is inseparable from its language of form," with the result as "architecture tied closely to its context." The interior of JBF LTD embraces a minimalist, black-and-white concept, expressed by the chosen furniture and 1,200 strung light bulbs suspended above the restaurant's diners--contrasting the original organically-inspired brick-and-wood space at Chelsea Market. 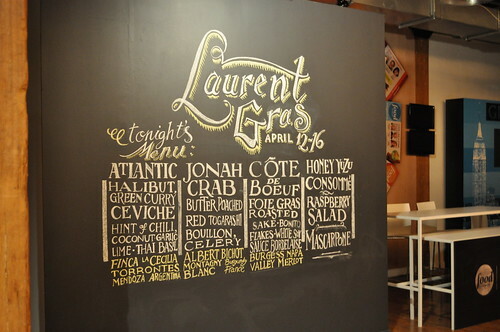 In spirit of the black-and-white minimalist-theme, the chalkboard in the rear of the restaurant was filled with beautifully text, announcing Chef Laurent Gras' pop-up residency for the five days and the menu he crafted for his dinner those nights. The wine pairings appear in yellow, below the course descriptions. 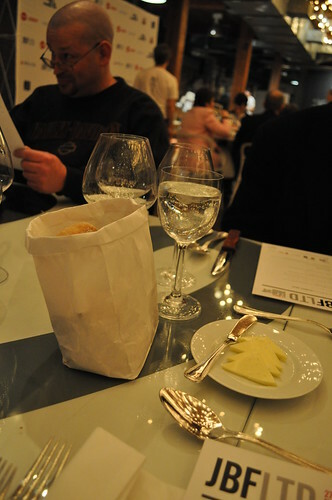 The bread "basket" was a nicely folded over white paper bag served with triangle-shaped butter. On the table at JBF LTD--you can even see the number 23 on our portion of the table! All four rows of tables inside the restaurant are numbered just like the windows are outside, and each day, the corresponding numbered table is spray-painted a big X in red! 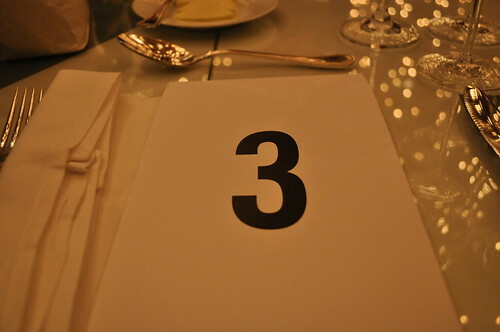 On the back of the menu was the 3 to represent the pop-up's third day of operations. We started out the meal with a glass of Finca La Celia Torrontes from Mendoza, Argentina with a 2008 vintage. It was light, crisp, and citrus-y with some slight floral notes--very subtle, rounded wine overall. The first course was the Atlantic halibut and green curry ceviche with a hint of chili, coconut, garlic, lime, and Thai basil. We found this ceviche to be really refreshing--it was citrusy (just like its paired wine), and the halibut had no fishiness to it. 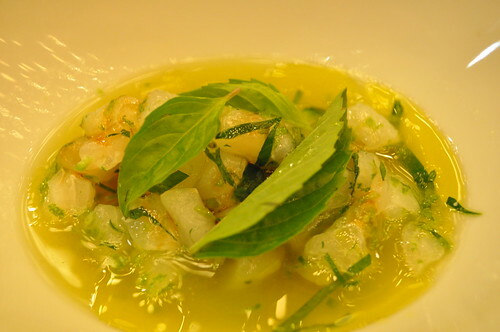 The curry flavor was very light--it was just a hint, where it didn't take away from the ceviche's other ingredients. We overheard someone describe this dish as zesty, and we couldn't have picked a better word! The ceviche's juices would have made for a great salad dressing--definitely adding it to my list of things to attempt to recreate in the future. The wine pairing amplified the flavors of the ceviche, while the ceviche brought out the subtle aspects of the wine to our palates. Little did we know that the remaining wine pairings would do so in the most intense of ways! The second course was butter poached Jonah crab with red togarashi bouillon and celery. It was paired with Albert Bichot Montagny Blanc from Burgundy, France--100% chardonnay with a 2008 vintage. 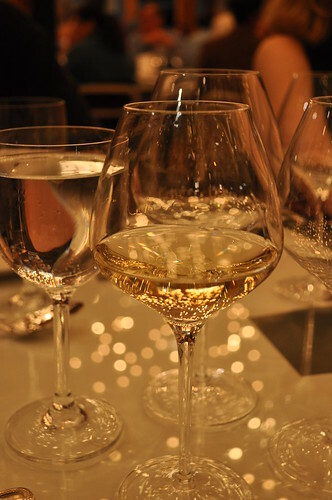 This white wine is fuller, than the previous wine from Argentina, with hints of apple flavors. I took a bite of the Jonah crab, and it was REALLY, REALLY good--probably the best crab I've ever had served outside its shell--buttery, foamy, soft, and loose. What followed (or should I say, unleashed) after tasting the wine with this course was this gastronomic symphony of intensified buttery goodness. The paired wine undoubtedly enhanced this course to its maximum potential--without the wine, a diner would have very well missed the harmonious reaction it created with the butter poached Jonah crab. It is as if the dish was already close to perfection, standalone, with some minor rough edges, but with the wine, it becomes more polished and as refined as it can be. Sommelier Robinson did wonders here--please insert gracious applause! Because of the wine, this is the best thing that I've eaten this year, to date. If I could've licked the plate until all of that poached butter foam was gone, I would've, but I kept composure and used a spoon instead. 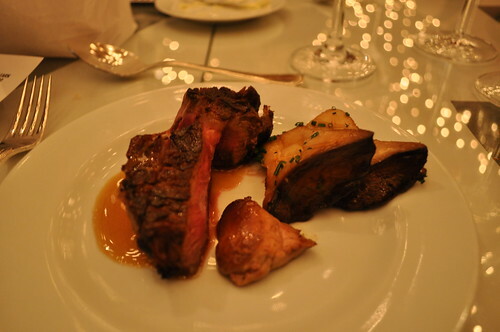 The next course was the Côte de Boeuf with roasted foie gras, bonito flakes, oyster mushrooms, and white soy sauce bordelaise, which was paired with Burgess Napa Valley Merlot with a 2005 vintage. The wine is a Merlot varietal with hints of cherry, blackberry, oak, and spice. The wine overall has a rounded, soft, and elegant texture. The Côte de Boeuf (a rib steak, generally cooked as roast beef in the English style) was cooked to the ideal temperature (for me, that is medium rare) and was soft and juicy in texture and taste. What made it even better is when you add a little piece of both the foie gras and the oyster mushrooms, swirling it in the bordelaise--it all melds together as a cohesive unit. It all tastes great individually, but the sum of its parts--a savory, culinary synecdoche--definitely outweigh its individual parts. The same applies with the pairing of the merlot. Add some of that wine into the mix, you've got an amazing Côte de Boeuf to enjoy for dinner. Chef Gras came out to greet the patrons before our last course came out. He seemed very soft spoken, smiling a lot. A round of applause accompanied his brief entrance into the dining room. Those courses just blew me away--simply just mind-blowing. One of the guys I sat next to during dinner was able to get Chef Gras to sign his menu (he's currently a chef who has been aspiring to work for Chef Gras himself)! Chef Gras left after doing this (I assume he had to return to the kitchen to help prepare the next dish) so I wasn't able to have him sign mine as well. A photograph will suffice, though! 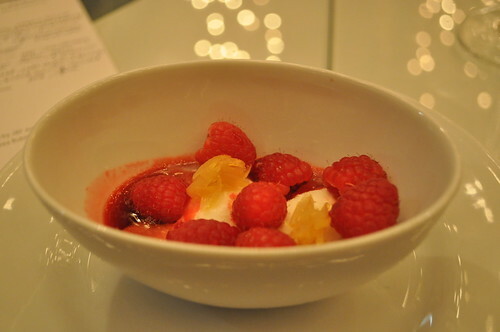 The last course was dessert--raspberry salad with honey-yuzu consommé and mascarpone. I think there was some yuzu zest in there as well (see yellowish-orange pieces). The honey-yuzu consommé was poured over the raspberry salad separately, after the dishes were served. Marcus didn't realize that there was such an addition (he thought it was already mixed in), so he just started eating it. He didn't seem to enjoy it as much as I was (he's more of a citrus guy than a berry one), until I realized he didn't have the consommé poured yet. Once they poured it for him, he immediately noticed the difference--it tasted that much better. The slight tang from the consommé along with the tartness from the raspberry salad and the creaminess from the mascarpone made for a light and refreshing dessert, as we had two savory dishes for the second and third course. If there had been bread pudding or chocolate cake, I would've left the dinner with a very heavy feeling in my stomach. Luckily the raspberry salad was almost like a palate cleanser that had the added bonus of being delicious, too! 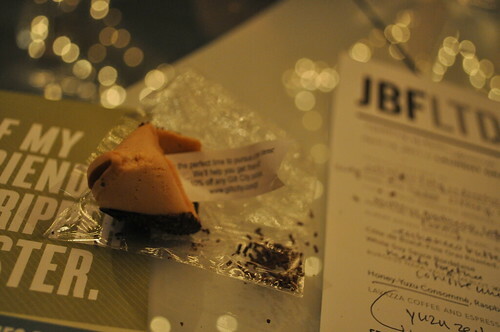 At the end of the meal, our servers gave us a chocolate-dipped fortune cookie (with chocolate sprinkles, too) along with postcards with cheeky quotes by Mr. Beard himself. 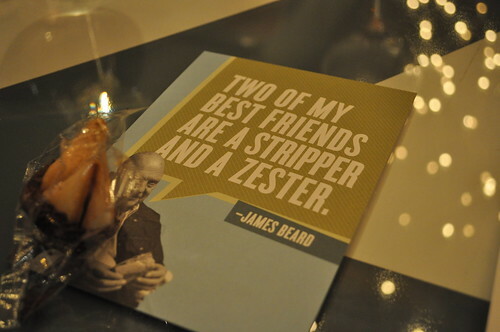 I liked the one I was given--"Two of my best friends are a stripper and a zester." Can't get any more double entendre than that in the culinary arts! The fortune inside read: "It's the perfect time to pursue a new interest. We'll help you get there with 10% off any Gilt City purchase." What a nice surprise from Gilt City! Findings: First thing's first. This was hands down the second best meal I've ever had (Alinea in first and my first visit to Eleven Madison Park as the third). The butter poached Jonah crab paired with the chardonnay from Burgundy was simply mind-blowing--you could've given me two more plates of that and an indefinite food coma was guaranteed for the rest of the night. Everything else was just as spectacular--not one course was disappointing. There was nothing I would think of changing if I could redo the night over--I would just redo it just as it was! 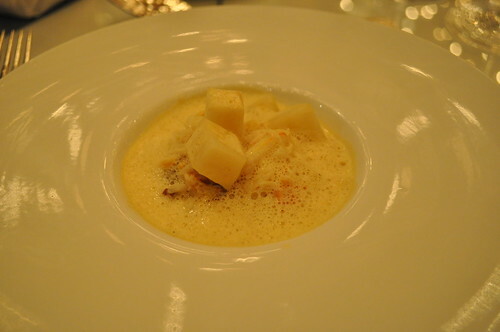 One thing I admired about Chef Laurent Gras' cuisine is the influence of Asian flavors on his contemporary approach (e.g., the halibut had green curry and coconut; the Jonah crab had togarashi, a Japanese spice; the Côte de Boeuf had Japanese bonito flakes, i.e., dried flakes of bonito fish that "dance"; and the raspberry salad had yuzu, a Japanese citrus fruit. I also noticed the overall synergistic nature of the courses he served tonight--for each course, all the ingredients by themselves tasted the way as they should, but when served and eaten together, the dish just becomes so much better than it already was. The wine pairings by Sommelier Andrea Robinson polished the courses even more--it was the best wine pairing I've ever had in a formal multi-course dinner setting. It was as if the wine was meant to be with the course with which it was paired. I'm still thinking about the intense buttery sensation I tasted when I had a taste of the chardonnay with the Jonah crab--it's going to take lots to top that! Major kudos, bravos, applause, and whatever other praise a chef of his caliber deserves to Chef Gras for this amazing four-course dinner as the first in-house resident of JBF LTD! I can definitely see why he impressed the inspectors over at Michelin during his tenure at L2O--simply gastronomic ingenuity on his end. I hope he finds his new home in New York City! 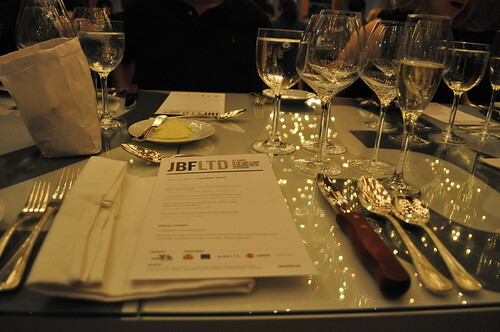 All in all, it was a great experience, seeing the James Beard Foundation turn an empty space at Chelsea Market into a minimalist dining space for its pop-up restaurant, JBF LTD. The interior was stunning for the shoestring budget Biber Architects were given. The service was great--everyone I had encountered were excited and enthusiastic about being part of the whole experience. I look forward to attending more James Beard Foundation events as well as using Gilt City to explore up and coming culinary events in the city. 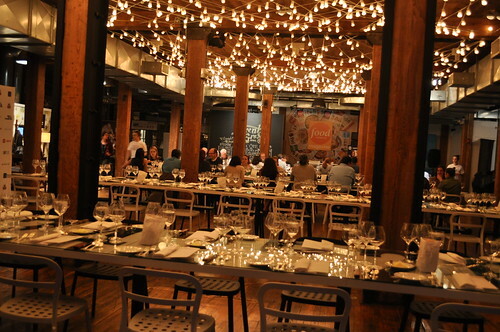 Thanks to Gilt City for making it easy to score tickets to this extraordinary dinner, and thanks also to the James Beard Foundation for inviting Chef Gras to "pop-up" in New York! Price point: an exclusive four-course meal prepared by three Michelin-winning star chef, Laurent Gras, for $75; $83 on Gilt City! JBF LTD: Laurent Gras deal was available here*! * This deal is no longer available, as the event was sold out and has passed.